The top sports car series in America will become one in 2014 it was announced today. Begining in 2014, there will be just one major sports car series operating in the United States as officials of the Rolex GRAND-AM and American Le Mans Series announced Wednesday that they will merge their operations. The announcement was made during a press conference held at Daytona International Speedway, site of the historic Daytona 24-hour race. “I think that sports car racing has distinct possibilities,” Jim France, co-founder of the GRAND-Am Series said, and that the merger will help those possibilities be realized. “The world is our oyster,” Dr. Don Panoz, founder of the American Le Mans Series, said. The new series will have a new name but that name is yet to be determined. Also to be determined is a schedule and the number of races to be held in 2014, though officials said that 12 races would be a workable number. 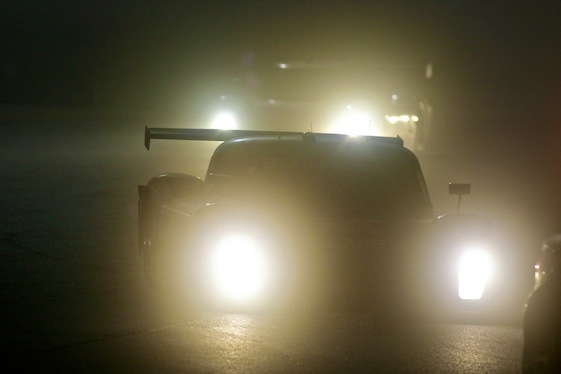 Both the Daytona 24 and Sebring 12-hour races will remain on the schedule. The big hurdle the series must clear over the next year and a half is settling on a rules and specification formula for the prototype and GT classes, officials said Wednesday. Whatever form the new series takes, every effort will be made to maintain the relationship between it and the 24-hour race at Le Mans and the racing body which sanctions that annual event. The ALMS began in 1999 with Grand-Am starting a year later, both attempting to fill the gap left by the end of the IMSA GT Championship which had operated from 1971 to 1998. Both sanctioning bodies will continue to operate separate schedules in 2013 before racing under one banner in 2014 beginning with North America’s premier sports car race, the 52nd annual Rolex 24 At Daytona. A board of directors has been formed to operate the new combined organization with France as chairman andPanoz as vice chairman. Other members: NASCAR Vice Chair/Executive Vice President Lesa France Kennedy, GRAND-AM President/CEO Ed Bennett, ALMS President/CEO Scott Atherton and NASCAR Vice President/Deputy General Counsel Karen Leetzow. “Today’s announcement will transform sports car racing on this continent, along with having world-wide industry implications,” said Bennett. “Aside from the organizations involved, everybody wins: drivers, teams, manufacturers, sponsors, tracks – and most all, the fans. Pierre Fillon, president of the Automobile Club de l’Ouest, gave the move his blessing on Wednesday. “The merger of these two championships,” Fillon said, “which was carried out with the approval of the Automobile Club de l’Ouest, has become necessary to enable endurance racing to continue to evolve. In 2014, this branch of the sport will have a bigger calendar and high-quality fields. Everybody will benefit from this unified series: entrants in North America, drivers and fans. This rapprochement proves that Automobile Club de l’Ouest’s assessment of the situation is the right one, and one of its major initiatives is to reinforce the presence of endurance racing on the international scene.